8.70€ Bottle 75 cl Tax incl. 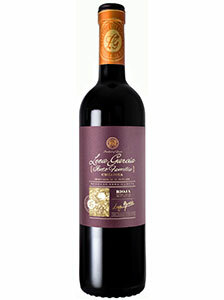 Capacity (cl): 75 Service Temperature: 17-18 º C.
100% Tempranillo varietal wine. Fruit of the rigorous selection of the best grapes from our oldest vineyards and of a careful elaboration, macerated in small tanks. Refined in American oak barrels. new for fourteen months and matured in the bottle until it reaches its finesse and personality.